30,000&plus; illegals from countries listed as having high terrorist concerns have crossed the Mexican border into the U.S.
What is the Muslim Brotherhood doing in your state? Why did John McCain enter Syria illegally on February 23, 2017? Photos: A woman is executed in the street. Her head is "hacked" off and she died slowly and brutally. Saudi Arabia now heads the UN "Human Rights Council" and is a member of the UN "Women’s Rights Commission" that monitors women's rights. Why is no one alarmed by this? Why is no one outraged by this? 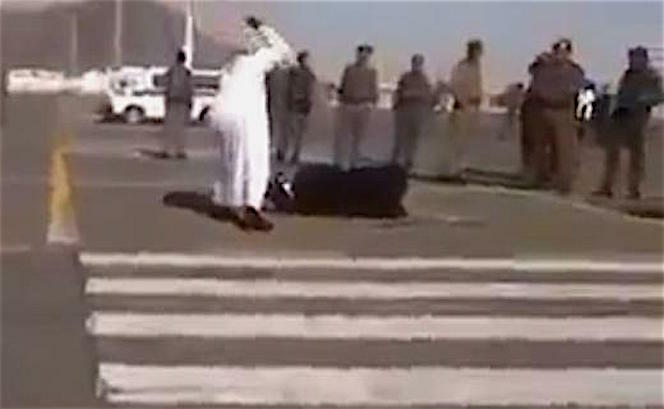 Human rights and women's rights do not exist in Saudi Arabia. People are not even allowed to play music in public as music is forbidden according to Islamic Law and the Religious Police can arrest you for it. How can this country, a country known for its human rights violations and deprivation of women's rights head these two UN commissions? Additionally, the US envoy for the "Global Coalition to Counter ISIS" met with Saudi Arabian Prince Muhammad bin Nayef to discuss ways to counter ISIS propaganda. Counter propaganda? This is absurd. Saudi Arabia is a major backer of several terrorist groups and the propaganda organizations affiliated with them. Saudi Arabia will not "counter" propaganda. They are the Kings of propaganda. They will slyly continue to promote propaganda. A member of the US envoy who met with the prince, Brett McGurk, said in a Tweet that he and Prince Muhammad bin Nayef met in Riyadh "to coordinate coalition efforts to counter ISIS propaganda and foreign fighter recruitment". Counter foreign fighter recruitment? Really? More than two million Muslims go to Hajj each year. It’s a massive, well-coordinated “travel event”. Ferry boats and other ships, normally used for Hajj to Mecca, were used to transport the first massive waves of “refugees” to Greece from Turkey and to parts of mainland Europe. The “refugees” were then immediately placed on trains and buses, which were also well organized and waiting, and which took the “refugees” deeper into France, Germany, and elsewhere into Europe. Who paid for the ferry boats and giant ships and the trains that funneled these men deeply into Europe? It was a well-organized event and thorough in its placement of many thousands of "refugees" into various European countries. It was a Hajj-like invasion of fighting age male Muslims -- the majority of whom had no passports or ID of any kind. It was deliberate that they carried no I.D. -- you were to believe that these were "Syrian" refugees. In 2014, the number was estimated at 12,000 foreign fighters from 81 countries, so that's well over 40,000 foreign fighters for Islam in a two year period. But the point is, no matter how you figure the numbers, an incredibly large number of Muslims from around the world continue to join the fight for Islamic takeover in Syria. Where do they get their abundance of weapons, ammunition, money and high-tech equipment? All of the Islamist armies in Syria have tanks, anti-aircraft vehicles and warfare. How? and who pays for it? During the last four years, Turkey and Saudi Arabia joined forces in backing foreign Islamist groups trying to overthrow the Syrian government in order to enforce Islamic Law. In 2015, Saudi Arabia and Turkey created a coalition army, an army with several divisions so it could spread itself throughout Syria. Turkey and Saudi Arabia fund and arm this army, called Jaish al-Fateh. And Turkey and Saudi Arabia supply it with endless foreign Islamist mercenaries—who cross into Syria via the Turkish border. Jaish al-Fateh was immediately successful. Their first offensive captured almost the entire province of Idlib (where they massacred entire villages of Syrian civilians and where the latest massacre of Alewites occurred on April 15th, killing 110 children who were being evacuated out of terrorist held villages). So, why should we trust Saudi Arabia to stop “propaganda” and to stop “foreign recruitment”. As I switch the TV stations from one western network to another, all I see any more is endless lies and propaganda. FOX was the last holdout, but now FOX has fallen. Could it be because Saudi Arabian Prince Alwaleed now owns the second largest interest in FOX? He was the fourth largest holder, but is now the second in control. As his power rose in ownership, FOX began to change. Alwaleed’s interest in News Corp. began in 1997 with a $400 million investment. News Corp. split into two companies in June 2013 due to the company’s phone-hacking controversy. The split created a brand new News Corp., which owns the Wall Street Journal, the New York Post and Vogue, and a second company that includes 21st Century Fox, which oversees the Fox News Channel. Murdoch is chairman of both companies, but who’s next in control? Prince Alwaleed of Saudi Arabia. News Corp. also has a sizable stake in Rotana, a broadcasting company that airs Arabic and English programming in the Middle East. Alwaleed owns an 80 percent stake of Rotana. And Rotana is mostly a propaganda station. Alwaleed is second only to Murdoch which translates to being the No. 2 owner of Fox News, which is 21st Century Fox, the giant movie and TV corporation that owns the network. Expect more lies and propaganda, on FOX and in your TV movies. 1. Many governments do not release estimates or travel documentation of the number of their citizens who have gone to Syria or Iraq. 2. For some countries, the number may reflect all those who have gone, while others subtract those who have died or returned; for example, those who left from Europe, as many as 30% returned, and those numbers are omitted. 3. Some countries do not include women and children. 4. In all cases it is likely that more have gone than the relevant government is prepared to admit. 5. Stats from the Soufan Group, data from 2014 and 2015, did not include the number of fighters that went to Syria from 2011-2013; hence, the number of 30,000 is extremely lower than actuality of fighters in Syria and Iraq in totality. 6. Countries like Chechnya do not give the numbers of children who are in the training camps, including the Caliphate Cubs, in which Chechnyans enter their children as young as three years old. 7. Many Islamist fighters cross into Syria unnoticed or illegally from Turkey, Jordan, Lebanon and Saudi Arabia, and are not counted. 8. Indonesia has the largest Muslim population of any other country in the world; a population of approximately 202.9 million Muslims. The Indonesian government did not give stats for these reports. But there have been several instances that allude to the fact that Indonesians support the idea of terrorism as a means to spread Islam and Islamic Law. Indonesia has experienced many episodes of Islamic terrorism and jihadist movements since declaring independence in 1945. After proclaiming an “Islamic State” in 1949, the organization Darul Islam denounced the Indonesian state as apostate and staged a series of armed rebellions in the 1950s and 1960s before moving underground. Daryl Islam then split into numerous groups, including Laskar Jihad, which led a campaign against Christians throughout Indonesia. Another offshoot group, Jemaah Islamiyah, conducted the 2002 Bali bombings. Indonesian jihadists have also gone to Afghanistan as mujahideen. With a population of 202,900,000 Muslims, a certain percentage of those would most certainly support ISIS and go to Syria, especially considered the Islamic State's slick recruitment Internet magazine and social media propaganda sites which are very appealing to young Muslims -- even in America.